Kolomela Mine, situated in the Northern Cape in South Africa, is Kumba Iron Ore’s newest operation. It mines lump iron ore, which is in high demand from Asian-Pacific as well as European steel markets due to its excellent physical strength and high iron content. Kolomela boasts an estimated life expectancy of 29 years, with around 23 years remaining, and has potential for further expansion. Kumba cemented its position as an early adopter of new technologies when it implemented automated drilling on the Kolomela Mine. This project was the first fully-automated drill fleet in Africa and aimed to increase utilisation, improve safety and performance, boost reliability and productivity, and save costs. Flanders was commissioned to supply the autonomous blast hole drilling control system, as they are renowned for engineering best-in-class solutions to overcome mining operation challenges. The system promised to improve safety, optimise blast-hole planning, generate more predictable fragmentation, and enhance the performance of the drilling fleet. Automated drilling presents many benefits as it promises to increase efficiency and reliability, while improving safety, minimising downtime and lowering operating costs. It is best suited for remote and inaccessible locations, and allows for more accurate pressure control and more rapid response to drilling anomalies. Combined with visual monitoring through high-definition cameras, a single person can operate multiple drills from a control room on a 24/7 basis. The remote command of mining equipment relies on line of sight through remote drill monitoring to honour the guidelines of the Mine Health and Safety Act, specifically guidelines towards Trackless Mobile Machinery (TMM). And, as the preferred supplier to Kumba Iron Ore, Sedna Industrial IT Solutions (Sedna) were asked to provide visual monitoring to support this. Axis Development Partner, Sedna, specialises in mining systems. Peter Dormehl, director of Sedna, has partnered with Kolomela over the years on technical mining solutions, and therefore understands the requirements and client preferences. A few years ago, Sedna built a Geo-Cam for monitoring operations within environments such as opencast mines, where there is no cabling infrastructure. The robust, mobile device is solar powered and locates positional information or tracks a moving object with GPS. The camera communicates via industrial wireless LAN and can be controlled (pan, tilt, zoom) remotely, allowing for remote monitoring operations. 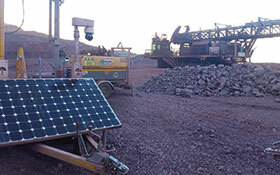 “Part of our solution to Kolomela was to install seven Geo-Cams, which were equipped with the Axis Q6115-E network camera as the base platform for drill and bench monitoring, while the Axis Q8722-E network camera was used as the base for the six thermal Geo–Cams for drill and bench monitoring in poor light or high dust conditions. “We installed outdoor Axis P3905-RE network cameras on the drills as they’re ideal for onboard surveillance. This is recorded and managed on a Milestone platform with the Geo-Cam software,” explained Dormehl. “The drill project deployment was rolled out over eight months by a strong, competent team of experts who helped contribute towards ensuring that our automated drilling delivers against an ambitious growth strategy,” concluded Sipho Mathonsi, manager, engineering at Kolomela Mine.